How do I register my loyalty card? How do I book a trip on the River King? Reservations for the River King can be made here. Questions? Give the Adventure Center a call 772-589-4345. Where can I make a dining reservation? 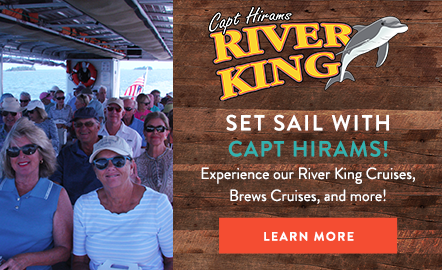 Capt Hirams Resort is located in Sebastian, Florida across the Indian River Lagoon from the Sebastian Inlet. You can visit the Capt by land or sea. Capt Hirams Resort was named after Sergeant Hiram Collins, a brave World War II solider and uncle of owner Tom Collins, who was killed at Normandy Beach. What time does the band play until? Are dogs allowed in the restaurants? As a pet-friendly resort, pets are allowed in the Hotel and permitted on the deck in between Blackfin’s Riverfront Grill and the Sandbar Beach Club. How late do you serve food until? The kitchen is generally open until 9:30pm Sunday-Thursday and 10:30pm Friday & Saturday. We also provide a Late Night Grill on the weekends until 12:00am serving hamburgers and hot dogs. Blackfins Riverfront Grill serves a mix of fresh seafood, New England favorites, and full entrees. The Sandbar Beach Club offers fresh seafood, delicious appetizers, and small plates. Happy Hour is Monday-Friday from 3pm-6pm. Loyalty Members receive extended Happy Hour on Saturday and Sundays from 3-6pm. Our Happy Hour Menu includes $2.50 well liquors, house wines, and domestic drafts. What are the hours of Blackfin's Riverfront Grill? What are the hours of The Sandbar Beach Club? What are the hours of the Boatique Gift Shop? What are the hours of the Adventure Center? How do I book a party or catering?